The table below represents an organizational chart of the Orange Mountains District committees. If you would like to view a People Finder, click here, please click here. Please note that not all district volunteers are named in the organizational chart. 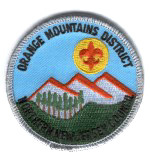 Orange Mountains District "Key 3"